Banner Size: 39" x 79"
Digitally printed customized artwork included with purchase for capturing max attention. 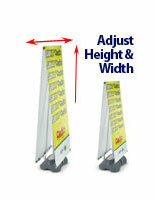 79" Tall, double-sided design is ideal for placement along a sidewalk or central location. Ground spikes included to anchor the collapsible banners to the ground. Folds down to fit compactly inside the included black nylon carrying bag. European manufactured, mesh fabric construction is specifically engineered for outdoor use. 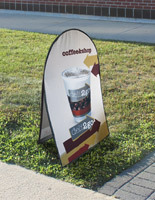 Why advertise with an a-frame sign when these collapsible tent banners sell for a fraction of the cost? Custom printing, a durable outdoor construction and the inclusion of all necessary accessories make these event displays an incredible value. These collapsible banners that are custom printed feature full-color digital graphics, allowing businesses to imprint photo quality images. Additionally, ground spikes and a carrying case are included with purchase as well. 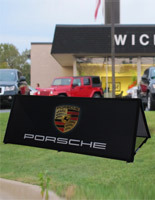 Users can transport the collapsible banners that are portable a-frames without fear of losing a component, as the bag keeps all pieces organized. The ground spikes keep the event display securely anchored in outdoor environments so businesses can advertise without fear of moderate wind gusts blowing the unit away. 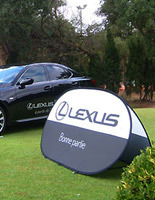 The collapsible banners have a tent-like shape with hook and loop straps that ensure the unit stays expanded. Setup takes only moments. As these collapsible banners simply need to be unfolded, have the hook and loop straps attached, and secured with the ground spike. Assembly is that simple! The A-frame collapsible banners have a mesh fabric construction that is not only lightweight, but durable enough for outdoor use as well. Each unit is manufactured in Europe with the finest craftsmanship and quality standards. 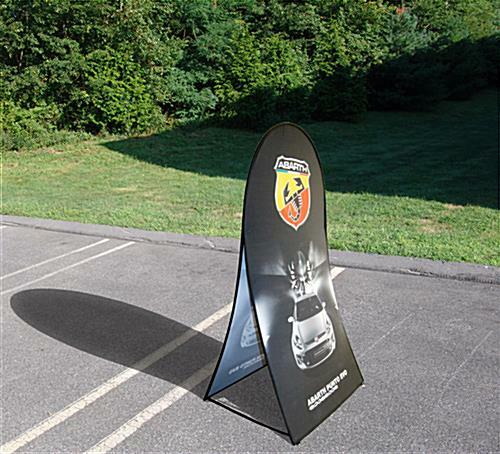 These collapsible banners that are popup a-frames are exactly what advertisers in search of an exciting and innovative alternative to retractable displays and sidewalk signs are looking for! Customization is a simple process. 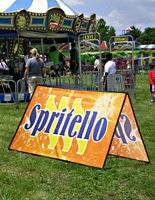 Simply click on the artwork template link below and create a custom advertisement for these collapsible tent banners. 42.0" x 1.0" x 34.0"